WASHINGTON D.C., May 9, 2018 – A free one-hour webinar on “A New Shape for Cost-Effective, Time-Saving Short Span Bridge Design” will be held on Tuesday, May 15, 2018 at 11:00 a.m. EDT as part of Infrastructure Week 2018. The webinar is being held in cooperation with the Short Span Steel Bridge Alliance, American Galvanizers Association, TEG Engineering, LLC, and the American Iron and Steel Institute (AISI). The presenter is Guy C. Nelson, P.E., S.E, a structural engineer with TEG Engineering, LLC. The webinar will provide an overview of the Con-Struct prefabricated bridge system, which utilizes precast concrete decks on galvanized, press-brake-formed steel tub girders. The system significantly cuts construction time and is cost-competitive with other bridge options. Once installed, it can last for a century with proper maintenance. It is a practical solution available now for rebuilding America’s critical bridge infrastructure challenges. 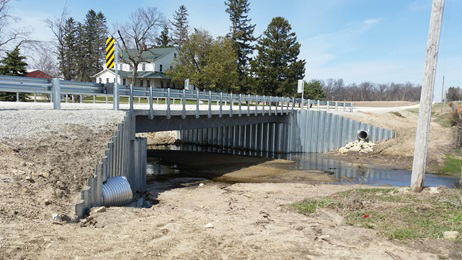 The webinar will include discussion of two bridge projects designed by Guy Nelson in St. Clair County, Michigan. It is being presented as a special addition to AGA’s Galvanize It! webinar series and is approved for continuing education units (CEUs), providing 1 LU or PDH. More information and registration details are available at https://galvanizeit.org/about-aga/calendar-events/details/sssba-infrastructure-week-webinar. Infrastructure Week 2018 is a national outreach being conducted May 14-21 to build awareness of and educate policymakers and citizens about the infrastructure challenges in the United States. Now in its sixth year, Infrastructure Week highlights the critical importance of investing in and modernizing America’s infrastructure systems and the essential role that infrastructure plays in the economy. AISI is an affiliate member of Infrastructure Week 2018 (http://infrastructureweek.org).